In the first episode of our podcast, A Writer’s Journey: From Blank Page to Published, author Terrance Zepke and I discussed a number of ways to begin plotting your book’s idea so you can get it down on paper. One of the methods I discussed was using the writing software called Scrivener. This post is not a tutorial on the software — there are already plenty of those online — but rather it is how I, personally, use Scrivener. To begin with, you might want to watch a quick video tutorial. There are some good ones on YouTube. I’ve already written on this site about how I like to use index cards to plan a book. I’ve also written about how I’m sold on outlining rather than pantsing, mostly because I had a terrible experience in the past with trying to pants a novel that just never came together. Scrivener offers multiple screen views for working with your novel, one of which is the bulletin board interface. 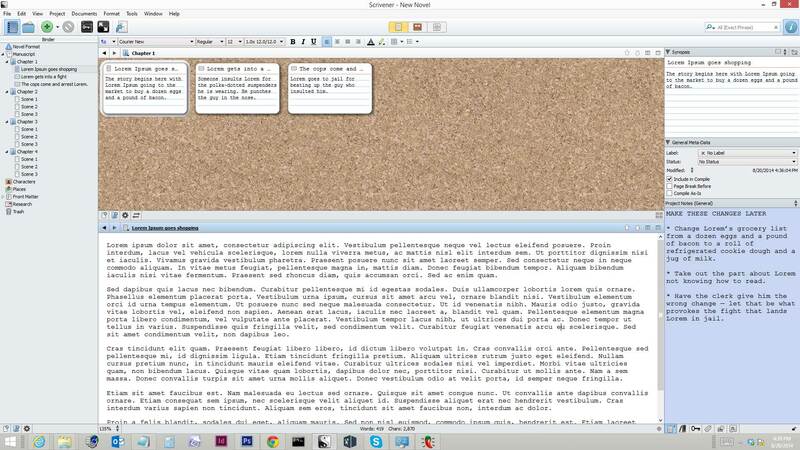 You can use the bulletin board in Scrivener the same way you would with index cards. Create new chapters and scenes by right-clicking either on the master list on the left, or in the main interface on the right. If you’re looking at your Manuscript view, it can show you index cards of each chapter. In the examples here, I’ve used numbers to identify chapters and scenes, but please note, I don’t recommend actually naming your chapters and scenes with numbers. Instead, give them descriptive names which will help you jump to any place in your project quickly without having to click on each scene or chapter to read what happens. Clicking on a chapter folder will give you a similar view, but with scene cards displayed. To quickly create placeholders for chapters and scenes, simply right-click on one of your chapter folders with scenes inside and then DUPLICATE. I do recommend giving more descriptive names to your chapters and scenes, though. The Chapter 1, Chapter 2, Scene 1, Scene 2 entries are just an example for this post. Once you have your chapters and scenes in place (provided you outline), you can begin writing. There are so many views available in Scrivener. If you like, you can have the bulletin board view of scenes within a chapter on top, and the current scene you’re working on in the bottom. Here is one layout I like to use when working on a novel. My master list is on the left. The big center column has the chapter’s scene list on top (I vary between using the bulletin board view and the list view) and the current scene on the bottom. On the right I have the scene synopsis and in the bottom right corner I have my scratchpad for revisions that need to be made. Keeping up with the details about main characters is easy, but when dealing with minor characters, it’s good to have a quick reference list you can check whenever that character comes up to make sure you are being consistent throughout the novel. For instance, in my book series, one of my characters has a very refined English accent, while a couple of other characters have the unique Hoi-Toide brogue common to the coastal North Carolina region. The Characters folder in Scrivener is a great place to keep track of notes about all of my book’s characters, including some who might not figure directly into this novel, but figure into the back story of my characters. Since ships are also mentioned frequently in my book, I also use the Characters folder to keep track of data on the various vessels. Just as is the case anywhere in Scrivener, you can create folders and subdocuments for just about anything. In my characters folder, I have text files for each of my characters. Most of them just get a card, but when a character has a lot of backstory, they get a longer file. I have a subfolder within the Characters folder for the ships that are mentioned in my story to keep the names separate from the character names. If you’re writing a contemporary novel, you may not have to do a lot of research. If your genre is historical fiction like mine is, however, you will have a ton of research. In my Research folder I have imported entire webpages, written text files with my own notes, and included sketches and maps relevant to the story. Another great tool you can employ is Evernote. This is just a brief glimpse at what can be done with Scrivener. In short, it is a brilliant piece of software that will make organizing something as sprawling and complex as the world of your novel — manuscript included — in one place. By taking advantage of the multi-window interface, as you write and revise, you’ll be able to quickly jump to earlier scenes without leaving the scene you’re in. In addition, having all of your research and character data at your fingertips can help keep you focused to write more efficiently. If nothing else, I recommend downloading a trial and then checking out the tutorial video posted above. I’d love to hear about your experiences with the software, or other programs if you prefer another. Please leave your thoughts in the comment box below. Because this is a public community, it is not necessary to have a Google Plus account to read the items (and comments) which have been posted by the members. However, responding to a post or posting an item of your own, would require a Google Plus account. The community has several categories (look in the left sidebar) which allows the visitor to narrow the items shown to posts which are more relevant to one’s own interests. Drop by and visit the community sometime, you do not have to log in or register or such-like to visit and read what has been posted. Thanks for sharing the link, James! I wasn’t aware of the Scrivener group on Google+. In addition to G+, there is also a group on FB, called “Scrivener users”. And of course, Scrivener maintains a page on FB and posts there regularly (I have it set to Notifications so that I get a note everytime Scrivener posts). Love, love, love Scrivener! It has made a huge difference in my writing, both through organization and planning. Great overview article!